When sixth-grade English/Language Arts teacher and half-marathoner Ellen Trebilcock injured herself in college, doctors said she might never run long distances again. But instead of accepting their predictions, she turned to yoga for rehabilitation and to balance her running practice. Today, she is not only running races but winning, too. Determined to share her passion for yoga’s benefits, she teaches a yoga elective three times a week to fifth- and sixth-grade KIPPsters. 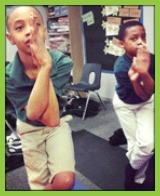 “I love getting our KIPPsters interested in yoga at a young age because it increases their ability to cope with the many challenges they face. And for athletes, it can be such a help to their performance,” Ms. Trebilcock says. In fact, yoga is now taught in thousands of schools across the country, and studies have found it improves students’ behavior, physical health, academic performance, and self-esteem. At KIPP TRUTH Academy, classes include discussions about respecting each person’s abilities and encouragement to try unfamiliar poses and tasks. “Yoga is a place at the end of the day that they can unwind and enjoy challenging themselves in new ways,” Ms. Trebilcock says. Get to know Ellen better by watching her video profile! This article is reposted from KIPP:DFW’s March 2013 News.